Collins Booksellers - An Atlas of Cat Anatomy by Hazel E. Field & Mary E. Taylor, 9780226160368. Buy this book online. 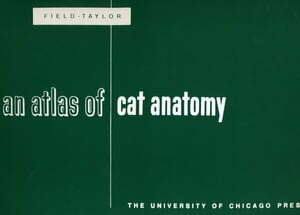 An Atlas of Cat Anatomy can help a student learn twice as much as he could in the same amount of time using only a written description. The book is spiral bound and stands like an easel, taking a minimum amount of space in the work area. Altogether there are fifty-seven plates featuring the various parts and organ systems in their actual size, making identification remarkably easy. A brief verbal description accompanies each plate. In addition, the extensive glossary includes synonymous terms, derivations, definitions, and keys to pronunciation.